Who doesn't love the internet?! And social media at that! Generally, being online and on social media is just about as normal as eating these days. While not all people have access, a lot of us do, and it quite frankly changing has changed the way we interact and live. Sans online bullying and inappropriate content, there's a lot of good things to be had with the internet and social media. Learning has never been so convenient, and information so close, inspiration is there if you start looking and reaching out globally has never been so easy. And there's another plus. It's the use of the internet and social media to remind us that yes, despite the negativity happening around us, there's a lot of reasons to spread good cheer and celebrate humanity, wisdom and kindness. I chanced upon this website Wake Up Project through my Facebook page timeline. A foodie blogger I follow kickstarted her #wakeupproject kindness experiment by paying for an extra burger at lunch and people paid it forward a few seconds after she did. Amazing! And so I got on the Kindness Revolution, signed up and received my kindness cards from the post yesterday. The idea is to think of a kind act, anonymously do your kind act and leave the card. The card left will tell the recipient of your act and asks them to repeat (or pay it forward) to someone else. Imagine the ripple effect of something this small. As quoted in the Wake Up Project website, "One kind person, multiplied by a 1000s creates a kindness revolution." While there are lot of people already doing this, volunteers and workers who take time to support a cause, a random act of kindness can create an amazing effect on a person. Now to food and what's new in ADU. Well, I've done it! I have finished my commercial cookery course at TAFE (technically I still need to submit some logbook requirements though, but all good!). It's such a cliche but time did fly. And it was a lot of fun! And to cap the 2.5 years was of course, a practical test in the kitchen, ala not-so-mystery-box challenge. Ingredients were given a week before and we were to prepare a 3 course meal. I'm sharing this simple dish I prepared for my mains. It's simple because all I really wanted to do on the last day was.... get it all over with! Ha ha! In a pan, heat some olive oil then cook the onions until soft. Add the mushrooms and stir to mix for a few seconds. Add the cream and the soy sauce, and season with salt and pepper. Let it simmer for about 20 minutes until the sauce has reduced and thickened. Set aside. You can warm this up again when ready to serve. In a small bowl, combine the softened butter, sultanas and pistachios and mix together with a wooden spoon until incorporated. Prepare the one chicken portion onto some fresh cling/plastic wrap. Spread the pistachio butter filling then roll the chicken gently while tucking in the cling wrap. You should have a wrapped chicken with filling. Repeat with the other chicken portion. In a shallow pan, boil about 1-2 cups chicken stock. Bring to a boil then reduce heat to a simmer. Place the wrapped chicken portions in the simmering stock and shallow poach until cooked, about 15-20 minutes. Let the chicken cool slightly before slicing diagonally and serve on a plate. Pour the mushroom sauce onto the chicken when serving. In a medium sized pot, heat some olive oil then cook the onions until soft. Add the capsicum and stir to mix together. Add the 1 cup chicken stock and reduce heat to medium, cover with a cartouche* and let the rice cook. Check every once in awhile if the liquid is drying up. Add the other cup of chicken stock, reduce to simmer and let the rice cook. Fluff the rice with a fork and make sure its not sticking to the bottom of the pan. 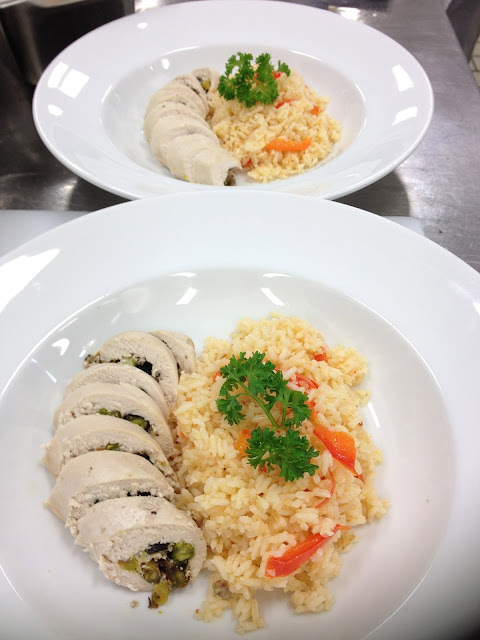 Serve onto a plate with the chicken roulade. * Here's a handy tip on how to make a cartouche when cooking. It's basically a piece of baking paper folded and shaped into a round to cover what you're cooking to avoid forming skin. I usually use it when poaching fruits and cooking rice stove top. It's also handy to cut a little piece off the point in the middle so you have a hole for the steam to pass through when poaching or cooking. So did you check out that Wake Up Project and Life Vest Inside website yet? I tell you its amazing. It's inspiring. And it touches hearts. I hope to spread some good cheer my way with my kindness cards soon. But we don't really need a card to do a good deed do we? Let's spread some kindness around, shall we?